JASC's Cavitating Pintle Valve for Metering of High-Pressure Hyrodgen. 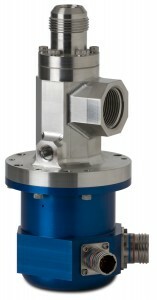 JASC: Engineering actuators and fluid control components. Cavitating Thrust Control Valve is a high-speed motor driven pintle valve with electronic control for metering of high-pressure hydrogen. Fuel System Uses JASC Pintle Valve Technology for Fuel and Ignitor Flow Control and precisely modulates fuel flow to the engine to maintain desired F/A ratio. Can be sold with JASC’s controller/driver. If you’d like to view JASC’s Cavitating Pintle Valve technical drawings, you can request them here.